Working as a computer analyst for a major computer company in the US, Samuel was used to having a large expense account to travel on. This included ample money for eating out, and living a highly active life. But all that was about to change. It was just after returning from one of his trips that he noticed some urine in his blood. Thinking that is was a bladder infection, he did not think much of it, but went to a urologist all the same. 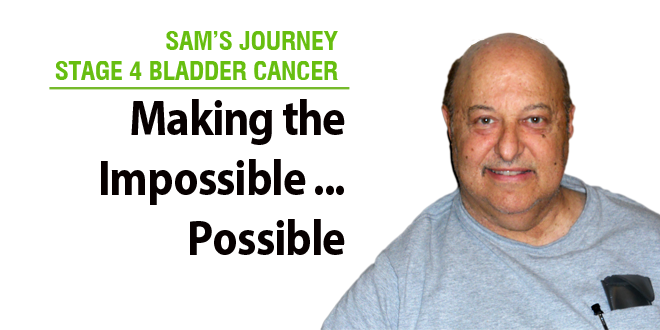 What Samuel would go on to learn was that he had Stage 4 Bladder Cancer. Patients diagnosed with stage 4 cancers are generally considered at high risk. Even though surgery may be considered, it may not be very effective because metastasis has already resulted in the cancer being spread to other parts of the body. However, surgery is what Samuel’s doctors recommend for him as his treatment option. After several hours of surgery, in 2008, all of the prostate had been removed, as well as a good deal of his bladder (which they rebuilt). Such drastic surgery was followed up with the usual chemotherapy and radiation treatments. However, surviving the surgery and beating the cancer are two completely different things. After the surgery he continued to feel unwell and was not able to work. His incontinence grew out of control, making simple things like eating out with friends embarrassing. Finally, sensing that something was just not right, he went back to his doctors. The bladder cancer had returned. The Next Level of Treatments – How Bad Can it Get? A Chance Meeting at the Airport – Or Was it Chance? This chance meeting (which Samuel states was Divine intervention) compelled Samuel to return to Mexico shortly thereafter to begin his treatments with Dr. Tony. He would go on to learn that Dr. Tony is one of the leading experts in alternative cancer treatments. Highly recommended and highly sought after as a speaker at various physician’s conferences around the world, Dr. Tony made a believer out of Samuel. “The Hope 4 Cancer Clinic is an oasis in the middle of the desert,” he says. To date, Samuel has undergone many of the cutting edge treatments in the clinic including sono-photo dynamic therapy treatments and hyperthermia. His diet has been changed to include limited meat consumption and as many unprocessed and natural foods as possible. His energy and vitality after only a few weeks at the clinic have remarkably returned. His goal now? To be able to walk his new Miniature Schnauzer puppy when he gets home. Not an impossible task at all.